Football gear is sorted and put into lockers the Thursday evening before home games. Photos by Tim Schoon. No one is tailgating when Paula Jantz arrives for the game. It’s pitch black and cold for a day that’s supposed to be summer, even if it is the last day, when the associate director of athletics arrives to ready Kinnick Stadium for the day’s game with Western Michigan. 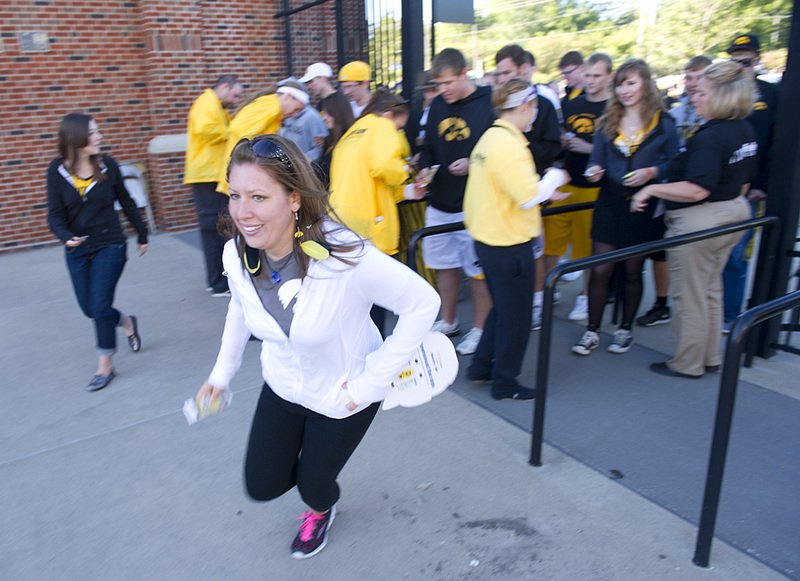 As the athletic department’s event coordinator, she directs the logistics behind Hawkeye sporting events, but with more than 700 employees to coordinate and as many as 70,000 fans to herd, none take as much time and effort as football. It’s a huge job, managing so many ticket takers and concessionaires and security personnel and parking lot attendants, making sure the paramedics are in place, the Big Ten Network people have what they need, the marching band gets its rehearsal time. 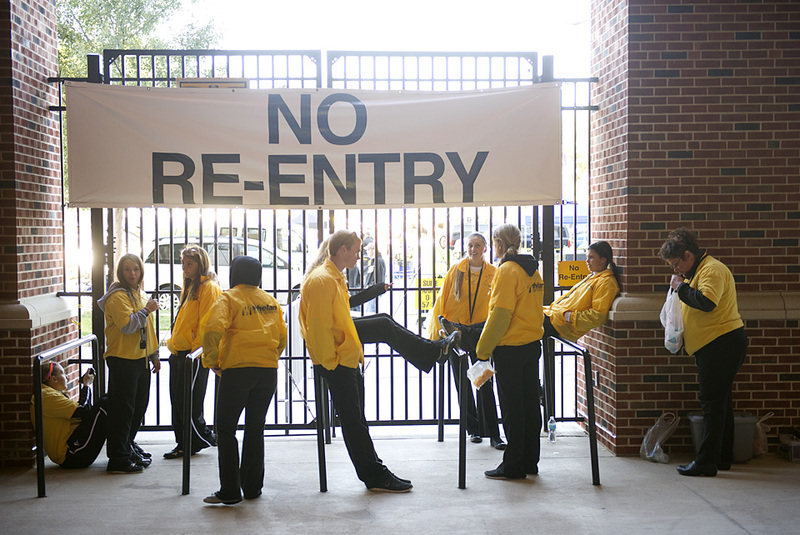 So she arrives early, at 5:30 a.m., for a game with an 11 a.m. kickoff, and not even tailgaters want to be awake at 5:30 a.m.
*it was from what she saw on this TV that Jantz made the call to suspend the game against Tennessee Tech in 2011, when a line of hellacious thunderstorms bore down on Iowa City. Then it’s downstairs to what she calls her luxury golf cart,* where she will spend the hours before kick-off driving around the stadium and its environs, looking for fires to put out, hoping to find none. Greg Morris is a details guy, the kind of person who thinks triple or quadruple checking is not a waste of time but an absolute necessity. It helps to be that way if your job is to keep track of 25,000 pieces of equipment, which he does as the football team’s equipment manager. 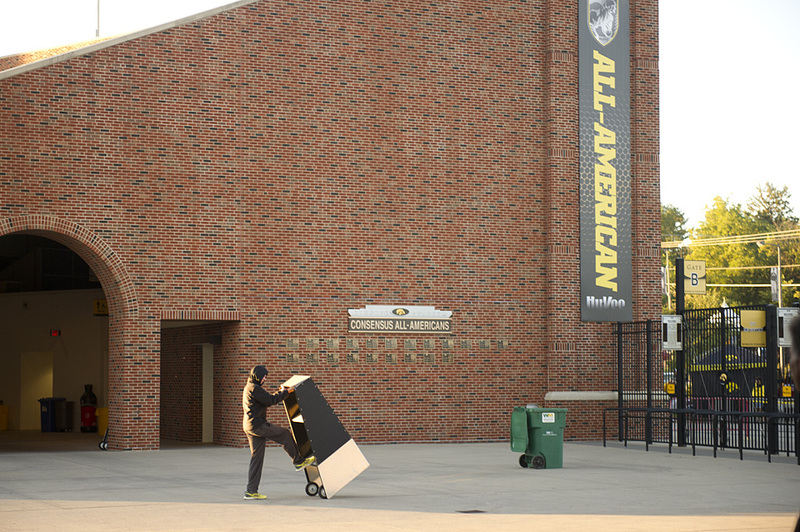 He and his 11 industrious student managers have to move 1,200 of those pieces from the practice field to the laundry to the Kinnick locker room every Thursday when there’s a home game. 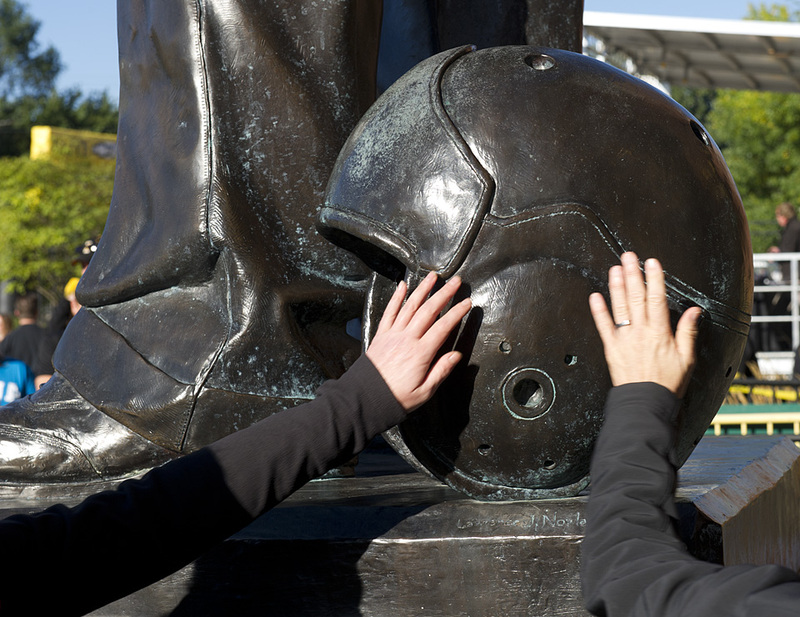 * They move everything from helmets to cleats, elbow pads to knee pads, the baseball caps the coordinators wear, Coach Kirk Ferentz’s shirt and pants. *on the road, they can have the equipment truck loaded up for the trip home in just more than an hour. “I can’t do my job without those guys,” Morris says. Morris has seen his share of uniforms since becoming equipment manager in 1988, starting with the heavy nylon porthole mesh jerseys of the 1980s (the one Houghtlin wore when he kicked the field goal against Michigan), through the universally loathed winged shoulders of the mid-1990s. Today, the home uniforms are a nod to simplicity, block numbers with the player’s name stitched across the back, leaving the flashy stuff to Oregon or Maryland. Morris says he’s not sure any one uniform style or material has any particular advantage over another, but football fashion, like fashion in general, is a fickle thing. The bare midriff jerseys of the 1980s give way to the mid-thigh pajama tops of today. 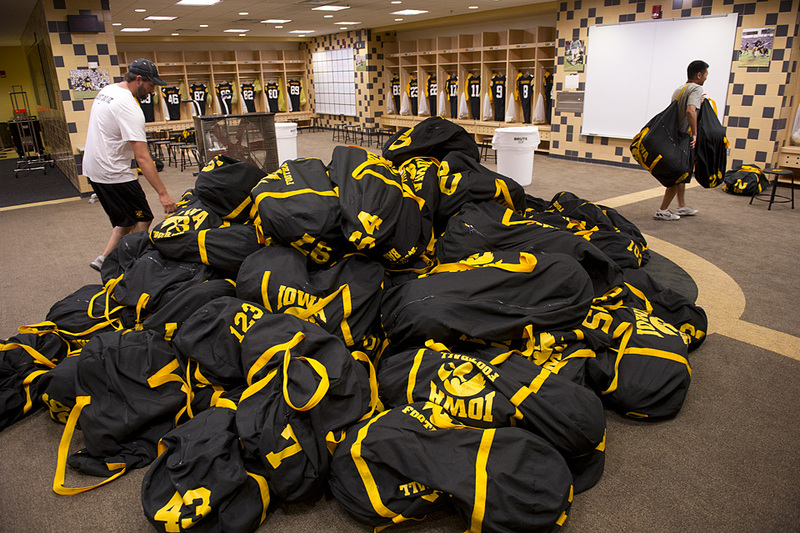 On Thursday nights before home games, his team wheels a mountain of equipment bags into the home locker room and unloads one for each of the 105 players who will dress for the game. 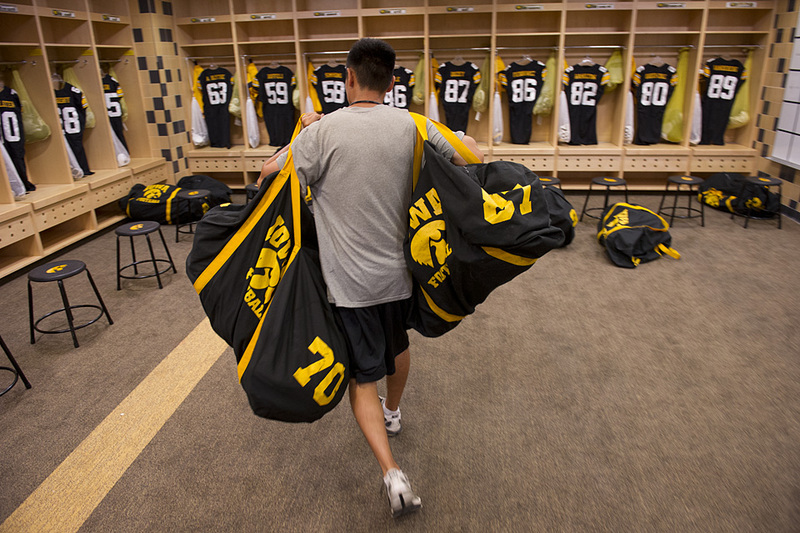 They carefully arrange each Hawk’s mesh equipment bag in the locker, set two pair of shoes on the floor, shine his helmet with floor wax, and hang his black and gold jersey from a hanger, his name and number awaiting him. Then, just before they head out for the night, they leave The Rock by the door, ready to be touched by every player heading out to the field. *interesting aside…..even though there’s no construction on Saturday, the crane nearest the stadium still needs an operator to keep the boom from swinging over the fans in the west bleachers. Without operators, the cranes swing free in the wind, so someone needs to be at the controls to keep it still during the game. 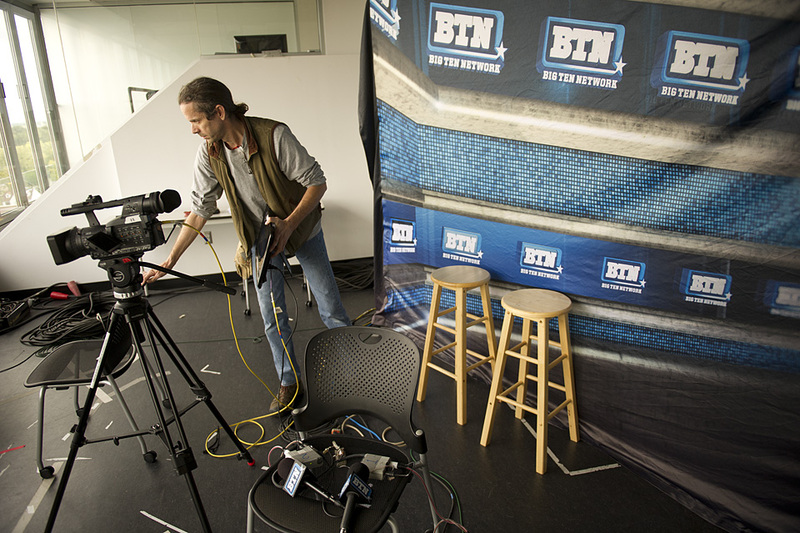 Kinnick’s narrow sidelines are a challenge for television because shooting sideline video and stand-ups with coaches is difficult to impossible with so little space. But whatever inconvenience that causes is more than made up by the fact that fans are right on top of the action, creating an electricity that comes through the television. The crew also shoots “scenics” the day before the game, those idyllic campus scenes that lead into and out from commercials. Denyes knows exactly where to get the best scenic at Iowa—his daughter, Alicia, graduated from UI in 2012, so he’s more than familiar with the campus. Scenes from the day before a game: concession tents and soda refrigerators and ice cream cases and hot dog grills are pulled from storage; wheeled trays of hot dog buns line the concourses; huge amounts of corn are popped and bagged for the next day; sausages are grilled, so the place smells like a bratwurst. 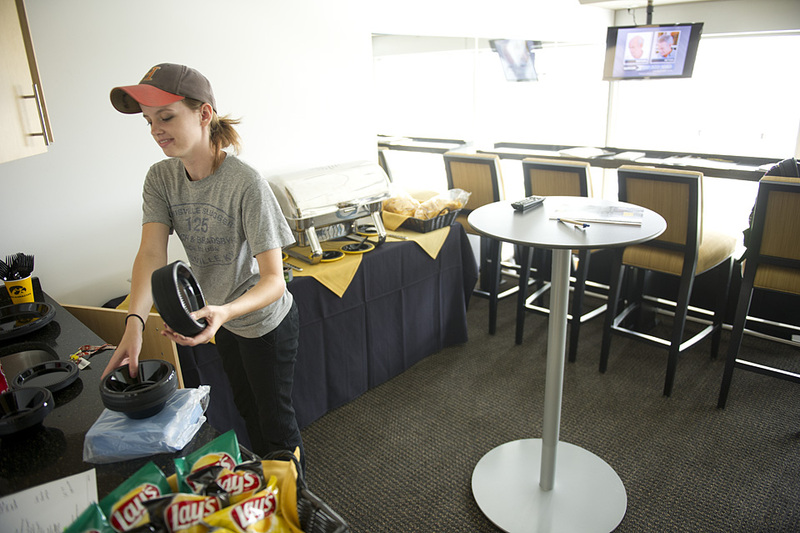 In the press box, workers fill the suites with food and beverages, vacuum the floor, clean the bathrooms. A radio producer checks his equipment so everything’s ready for Dolph and Eddie in the morning. The public address system is tested with pre-recorded announcements that rumble through the empty stadium. About 3:30 p.m., a worker climbs up a construction crane and unfurls a Tigerhawk flag from the boom. A Ryder truck arrives with Western Michigan’s equipment, and later, the Broncos’ players follow for a stadium walk-through. It’s still dark on Saturday and a few vendors are setting up across Melrose, selling t-shirts and trinkets, giant tenderloins and big you-know-what turkey legs, when Jantz takes her first spin around the stadium to make sure all the little details are taken care of. She greets every bleary-eyed person she passes with a hearty “hello everyone, how are you,” unnaturally upbeat for so early in the day. At 5:59, her walkie talkie squawks. “There’s the first one,” she says. But the first fire of the morning is nothing more than a match: someone needs a pass scanner, so she delivers an extra. Then it’s off to the Rec Center where employees of Whelan Event Planning are picking up their shirts and getting orders for the day. Their supervisor tells them to remember to smile. Then she’s off again to greet more parking lot attendants and sweep the RV campground at the College of Dentistry, stopping for a moment to enjoy the drum line’s warm up. Of course, she cheerfully greets everyone she passes. “I spend a lot of time saying hi,” she says. Of all the things that need pre-game tending, what needs the least is the field itself, which ultimately is the stage where the day’s drama will unfold. This wasn’t always the case. There was a time when an army of grounds crew members watered turf, repaired sod, and spent hours painting yardage markers, sideline boundaries and logos in the endzone. But turf today is made of FieldTurf, a durable plastic-like material that can withstand damage from even the biggest, quickest players. With field markings woven in, the field doesn’t really need much more attention than a pre-game rake. You’d think the people who run the giant HawkVision video screen would have a great view of the game. In fact, they have no view of the game, at least directly, from their window-less room under the south stands. * They see only what they can see on the eight cameras they have access to, four of their own, and four from the Big Ten Network. 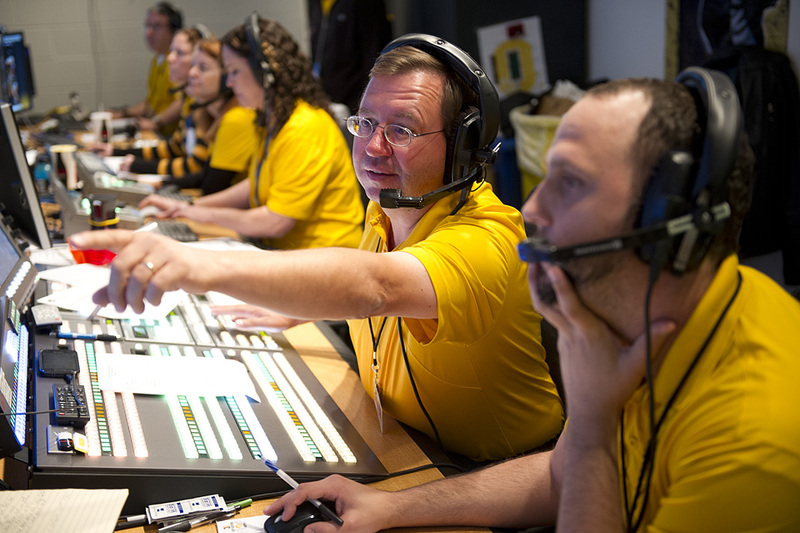 *They also control the HawkVision board in Carver Hawkeye Arena from here during basketball and volleyball games and wrestling matches. The HawkVision crew actually controls only part of the video board, which has three claims on its real estate. 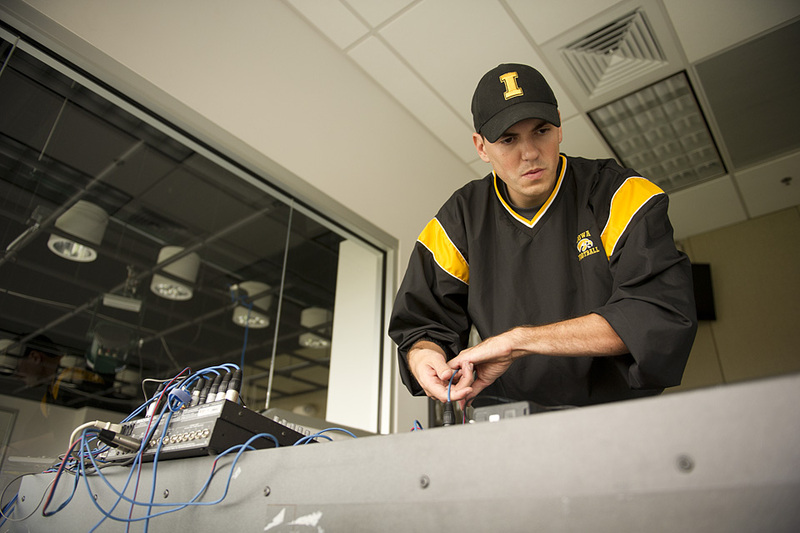 An official appointed by the Big Ten controls the game and play clocks from the press box, while the athletic department stats crew, also in the press box, controls down and distance, and updates game statistics. HawkVision controls the rest, as well as the ribbon board, from their bunker. The wall is nothing but monitors, and from here come the replays, the advertisements, the encouragements to make noise, and the Hawk-o-gram messages (“Happy Birthday, Cory. 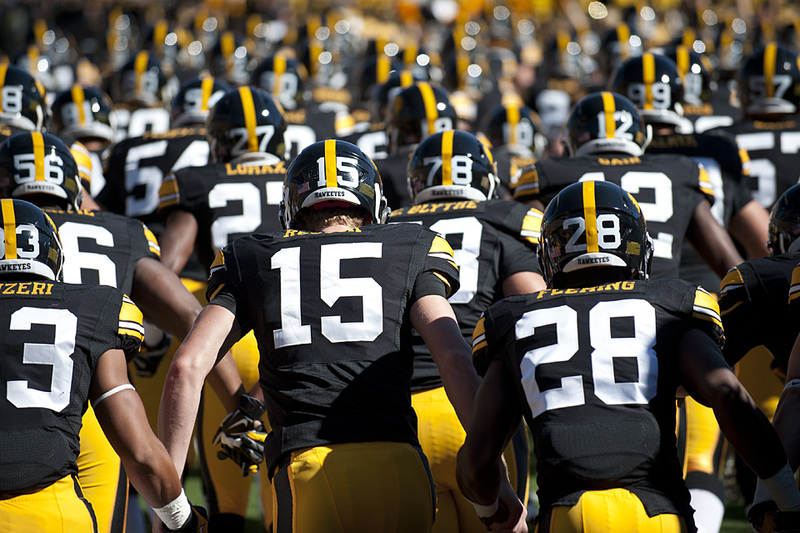 Represent the Hawkeyes proudly while studying abroad in Europe”). Much of the program is timed down to the minute, but Jim Berg, who oversees the operation for Focus Productions, says there is also an art to what they do. “If the other team scores, that might not be the best time to do the Smile Cam,” he says. The marching band doesn’t quite look like a marching band at 7 a.m. Still groggy, the musicians drag themselves to the Kinnick field in pajama bottoms and t-shirts, some wearing hoodies, others wishing they had. They start their warm ups just as the first rays of sunshine reflect off the very top of the press box. 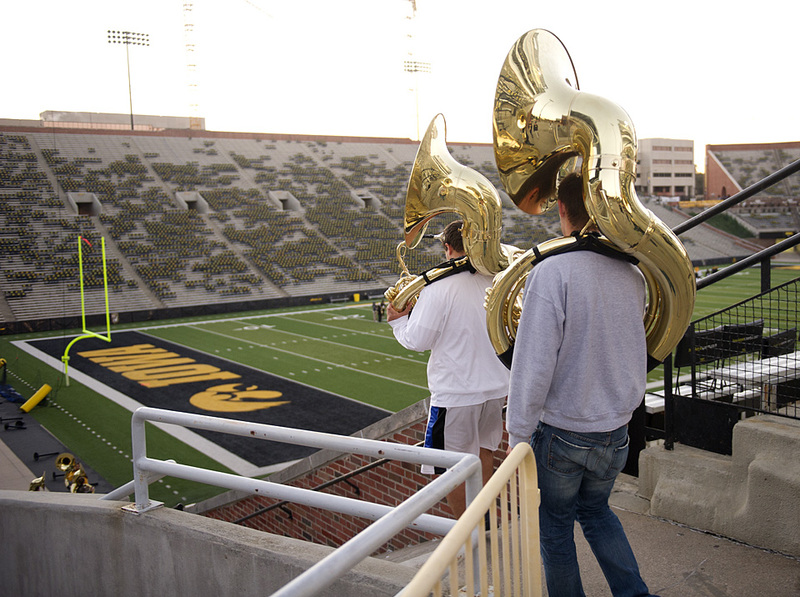 Here and there instrument sections warm up with the Iowa Fight Song, which quickly peters out and starts again. Slowly, the band members wake up, notes fit together, rough edges turn smooth. 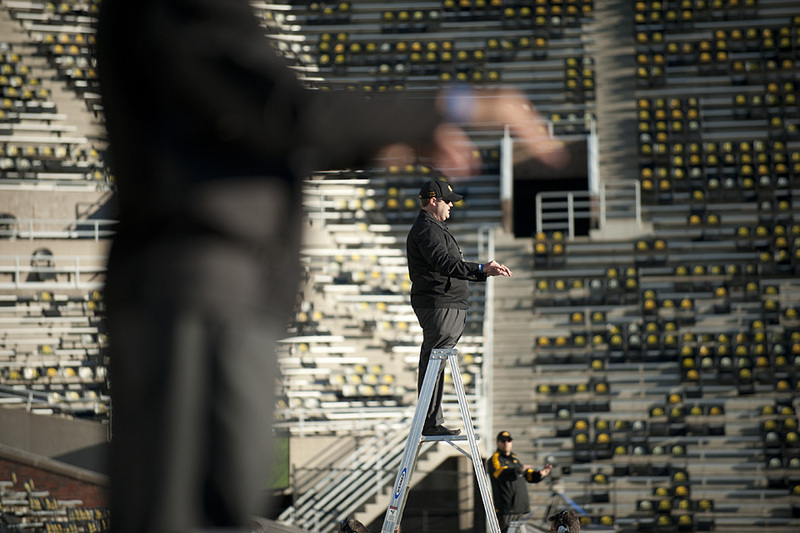 Director Kevin Kastens climbs to the top bleacher with a microphone and tells the sousaphones to move that way, the trumpets to move a little faster, tightening this edge, rounding that circle, until finally the shapes on the field have, indeed, taken shape and the band is ready. Tailgating is in full swing now, the parking lot full, Melrose swarming with fans waiting for the gates to open at 9:30. 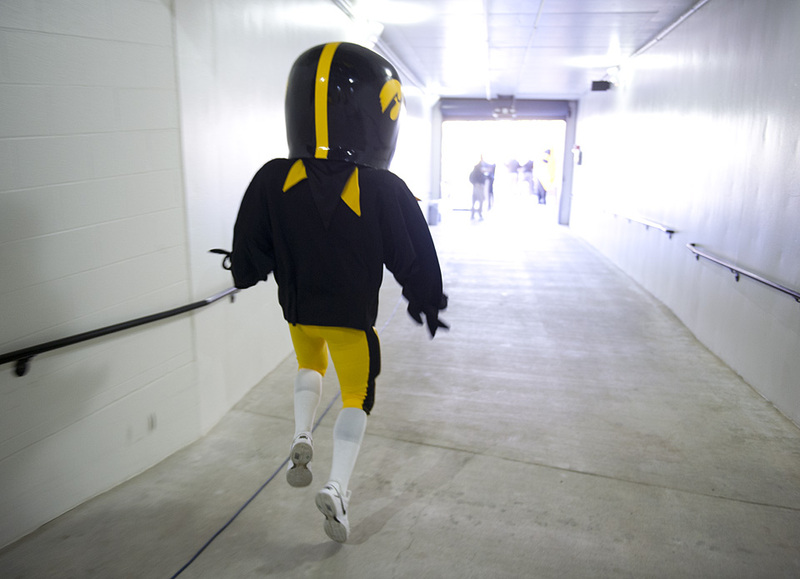 But inside Kinnick, it’s just another business day. 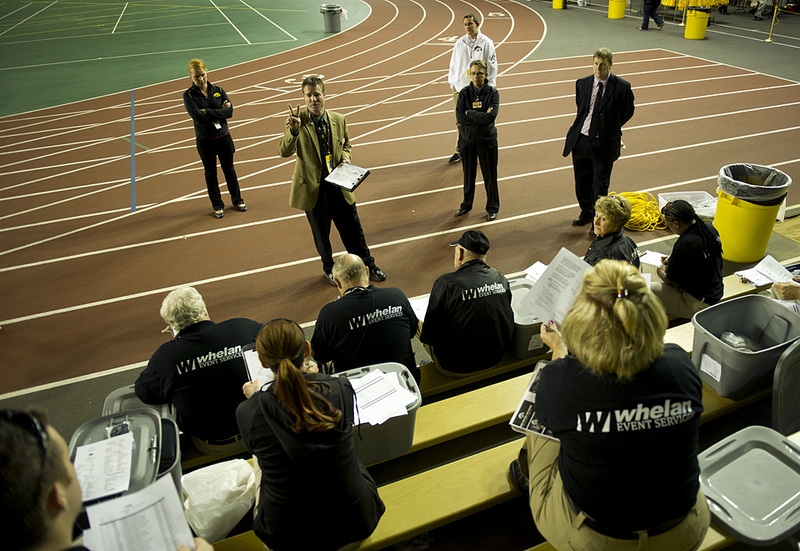 The game officials arrive and begin a preparation routine of their own. Ticket takers and security officers take up their gate positions, programs and game notes are left in the suites and the press box. Concession stand operators pop more corn, hang pretzels in their warmers, roll hot dogs on the grills. At the Sideline Snacks concession stand, just off Gate B, the Sweet Adelines prepare with song. The Cedar Sounds Chorus chapter from Cedar Rapid has staffed Sideline Snacks for as long as anyone can remember to raise money for their group. Being a chorale, it only makes sense they get ready for the day by singing. Through the morning, trash cans and recycling bins are brought into place and ready for the coming onslaught of hot dog wrappers, popcorn buckets, ice cream bar sticks and those little plastic cups they put melted nacho cheese in. Eric Holthaus, the university’s recycling coordinator, says fans can drop anywhere between six and nine tons of waste each game, and the concession stands also produce about 1,000 pounds of organic waste every game that needs to be composted. Students from the Delta Tau Delta fraternity station themselves at recycling bins at the gates of Kinnick and helps recycle, and plenty of recycling bins are available in the concourses for fans to use. 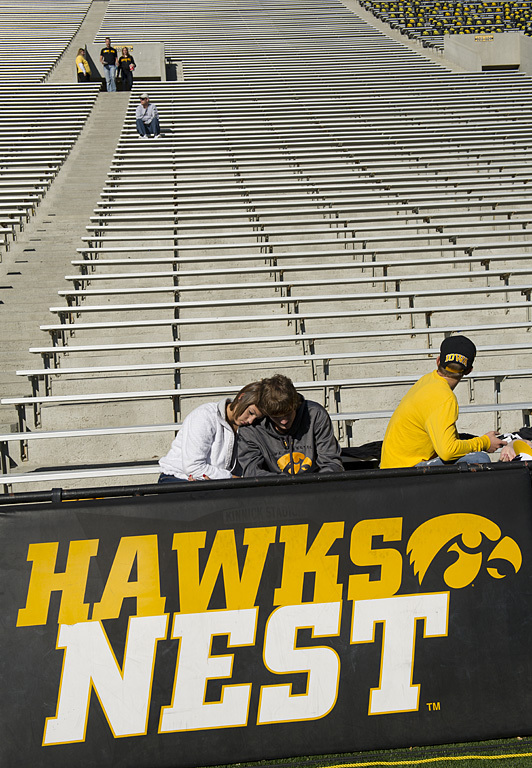 The day after a game, hundreds of students, parents, and coaches from around the area—mostly coordinated by Booster Clubs of Iowa City—clean the stadium. Popcorn buckets, water bottles, plastic cups, and papers can all go in recycling, says Holthaus, so that about 40 to 60 percent of stadium waste is diverted from landfills every game. Kickoff is only minutes away and the logistics team returns to its press box nerve center. The marching band is back on the field, now crisply dressed and fully awake. The kid captain is introduced. The teams make their way up the tunnels. All has gone well in Kinnickville, the fifth largest city in Iowa on game days. And so the Anthem ends, the fans rise and cheer with gusto as kicker Mike Meyer sends the ball end-over-end into a cloudless blue September sky.